Life With 4 Boys: Sports Illustrated Kids - The Perfect Gift for Boys! 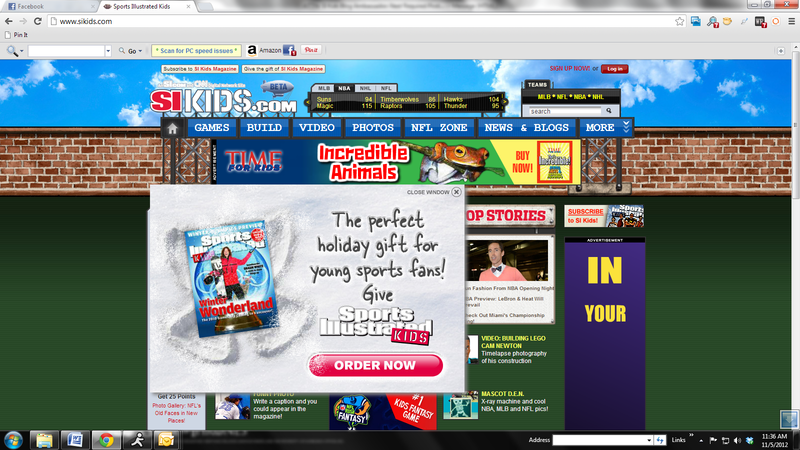 Sports Illustrated Kids - The Perfect Gift for Boys! Ahhh. I can't believe it is almost Christmas time again. I swear Christmas was just here last month, but maybe that just means I need more sleep. With Christmas comes the inevitable decision of what to get our children. Boys are hard to shop for. There, I said it. Older boys are especially hard to shop for, unless you are buying video games. I like to try and choose other gifts too, that will help encourage my children to learn and that is why I believe Sports Illustrated Kids is the perfect gift for boys (and girls) this holiday season. 1. It is the perfect stocking stuffer. 2. Each issue has photos, games and exciting stories that are perfect for distracting kids in line or while traveling. 3. It helps promote reading for children who are reluctant readers. 4. It's a gift that keeps on giving all year long. 5. No gift wrapping required. Another added bonus of a Sports Illustrated Kids Subscription as a gift, is that it is a gift that can be shared if you have more than one child. My boys receive a subscription and they all take turns reading it and enjoy different things about it. It even has Jordan enjoying reading and he has dyslexia. Not to mention, it has received the highest honors from the Association of Educational Publishers and the Parents' Choice Award. Right now, you can order an entire year (12 issues) in print and on tablet of Sports Illustrated Kids for only $19.95. Not bad for a gift that will keep on giving and surprising your kids all year long! For more information and upcoming deals, you can visit the SI Kids website and like them on Facebook. Our blog is participating in a sponsored blog ambassador program from Sports Illustrated Kids. As part of this program we received paid compensation, a year subscription and merchandise for placement of digital advertisements and specific postings related to SI Kids. This is a great magazine for any kid. I bought it for my son but my daughter loved it also. They have some great stories. I love that my kids will pick this up and read it just for fun. I didn't even know they had this. good idea. My son loves games in magazines, and is struggling with reading in school. This is a good idea. My mom used to get a subscription to Sports Illustrated for her oldest grandson every year. They didn't have the Kid's edition then, what a great idea. My mom would get my cousin a subscription every year. This is a great gift for kids who are into sports! My husband and I are contemplating getting this for our nephews. I would have never thought about gifting SI, thanks for the suggestion. That's an awesome gift idea for boys, and sporty girls too!